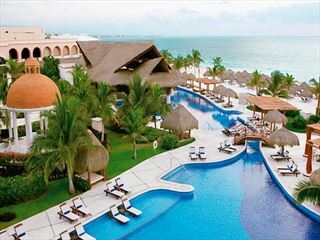 Are you seeking an extremely good value for money All Inclusive beach hotel? 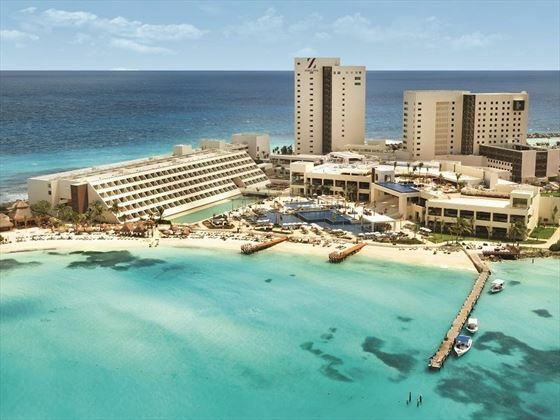 Hyatt Ziva Cancun offers just that and is a top choice for anyone seeking relaxation, fine cuisine and is an affordable luxury option for singles, couples and families. The luxury accommodation including swim-up suites, three infinity pools (including one adults only), three oversized hot tubs, unique daily and nightly activities and resort butlers are there to enhance your pool and beach experience. 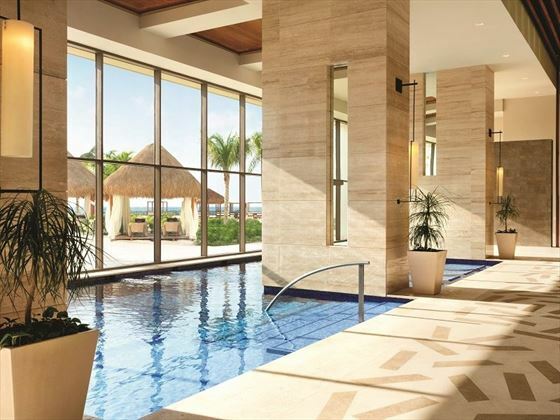 You’ll even be treated to unlimited dining options and a world-class wellness centre, making Hyatt Ziva Cancun a top choice for anybody looking for that perfect beach getaway. Ziva Rooms – Luxurious 483sq ft rooms have a furnished walk out terrace and lovely views of the gardens. These come with one King size bed and a sofa bed or two double beds. Sleeping a maximum of four. Ziva resort View rooms – Elegant 483sq ft rooms feature splendid views of the resort from the comfortably furnished private balcony. These come with one King size bed and a sofa bed or two double beds. Sleeping a maximum of four. Ziva Ocean View rooms – Magnificent ocean views from the private balcony are a highlight of these lavish 483sq ft accommodations. These come with one King size bed and a sofa bed or two double beds. Sleeping a maximum of four. Ziva Ocean Front rooms – These oceanfront rooms offer 483sq ft of luxury, including a private balcony and panoramic ocean views. These come with one King size bed and a sofa bed or two double beds. Sleeping a maximum of four. 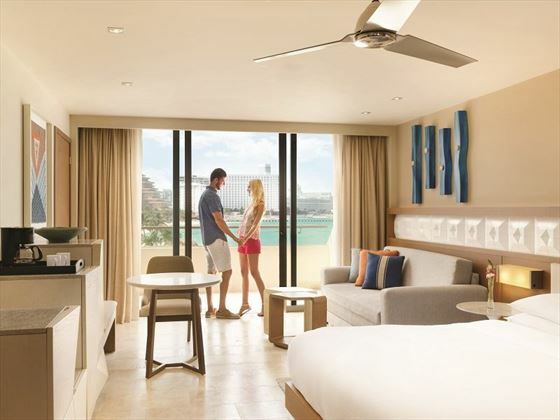 Club Ocean Front rooms – These 463sq ft rooms with a private balcony promise stunning oceanfront vistas plus exclusive Hyatt Club Level amenities*. These come with one King size bed or two double beds. Sleeping a maximum of four. Swim-up rooms – Exclusive 712sq ft swim-up rooms include a semi-private pool right off the balcony and splendid views of the ocean. These come with one King size bed or two double beds. Sleeping a maximum of four. 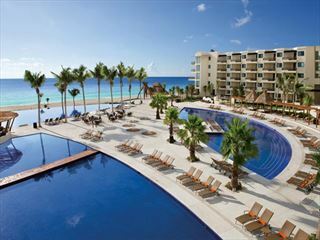 Turquoize Ocean front Master Rooms – Located in the adults-only tower and offering access to the Hyatt Zilara Cancun resort and restaurants, these 695 sq ft rooms feature a hot tub on the private balcony. These come with one King size bed or two double beds. Sleeping a maximum of four. 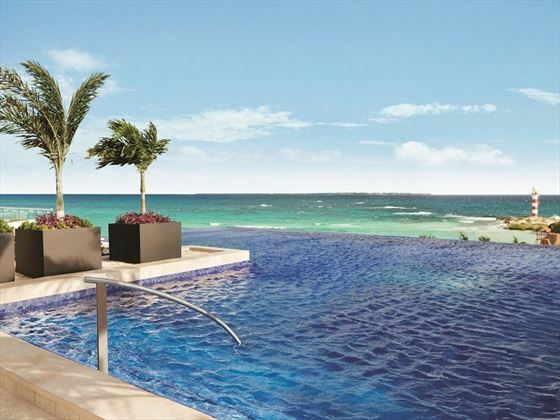 Turquoize Sky Ocean front Master Rooms – The balcony has a private hot tub and access to a semi-private sparkling infinity pool overlooking the ocean in these 695 sq ft rooms in the adults-only tower, with access to Hyatt Zilara Cancun as well. These come with one King size bed or two double beds. Sleeping a maximum of four. 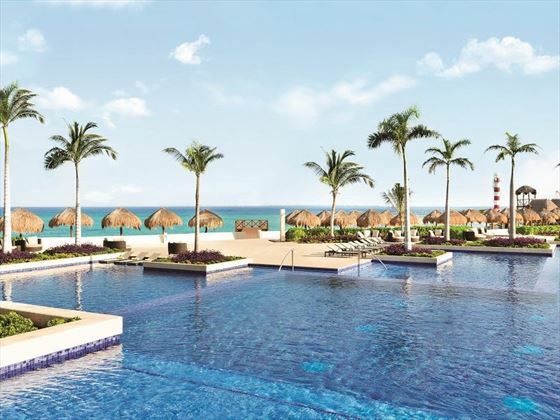 Turquoize Sky swim up Ocean front Master rooms – high in the adults-only tower, these 695 sq ft rooms offer unforgettable ocean views from the private balcony and hot tub, plus the additional enjoyment of Hyatt Zilara Cancun. These come with one King size bed or two double beds. Sleeping a maximum of four. Club Ocean front Corner suite – Covering 1087 sq ft of luxurious space, these corner suites have a private balcony with a hot tub and ocean vistas, as well as the amenities of the exclusive Hyatt Club Level. These come with one King size bed and a sofa bed. Sleeping a maximum of four. Club Ocean front Master Suite – Offering Hyatt Club Level amenities and a sky-high view of the sparkling ocean, these grand 1524 sq ft suites feature lavish interiors and a private hot tub on the balcony. These come with one King size bed. Club Two-bedroom Oceanfront Suites – at 2115 sq ft, these two-bedroom suites offer ample space and luxurious comforts, such as Hyatt Club level privileges, a private balcony with a hot tub and marvellous oceanfront views. One king and two double beds. Brasserie – Classic and romantic restaurant serving French cuisine. Open for dinner only, adults only. Mercado – Gourmet international buffet restaurant open for breakfast, lunch and dinner. The Moongate – Asian style restaurant open for dinner only. Breeze Grill – Casual grill by day and a steakhouse by night. Oceanfront and open for breakfast, lunch & dinner. Mangiare – Traditional Italian restaurant open for lunch and dinner. Juana Margarita – Open for lunch and dinner this restaurant serving Mexican style snacks. Chevy – Classic American diner open for lunch & dinner. Azucar – Desert parlour open for lunch & dinner. Coffee House – Espressos, cappuccinos and other delicious beverages are served here. Open for breakfast, lunch and dinner. Food Carts – Travelling food carts filled with tacos, burgers, fresh fruit, crepes and cool beverages with roam the pool and beach areas throughout the day. 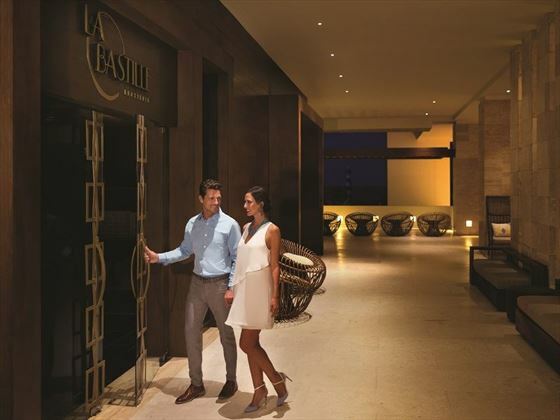 Saasil Bar – Relax within the lobby’s breezy, contemporary décor inspired by the region’s Mayan heritage, or sit outdoors and take in the stunning ocean views. La Cantina – Get a taste of Mexico by sampling a selection of local tequilas. Cerveceria – Sports Bar with its own micro-brewery and brewmaster. La Vista – roof top, adults only cocktail bar. Delfines – Pool bar with swim-up section. 24 Hours – exactly what it says on the tin, a 24-hour bar. 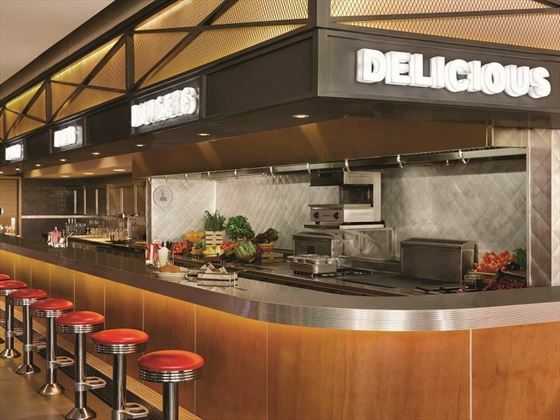 Playa – an exclusive bar for Hyatt Club level guests. The Club – another exclusive bar for Club level guests which offers snacks and fine wine or premium cocktails and overlooks the infinity pool.